Designer Custom Source offers premium outdoor living cushions and an assortment of fabrics including Sunbrella, Robert Allen, Geobella, and Outdura. We select our fabrics based on their reputation in the market place, durability, ease of care and warrantees. Of course, as with any fabrics, proper care will extend the life of the product. At Design Custom Source, we believe that what is on the inside is as important as what is on the outside. For outdoor cushions, we recommend our Optimal Comfort inner fill option which we give a 5 star rating in Retention, Comfort and Weather- Resistance. We start off with our quality upholstery foam which is layered with ½" to 1" MicroGel Memory Foam on the top and bottom. Next, we wrap this from front to back with 1" poly fiber batting for even more plushness and softness. This is then placed inside a weather-resistant, Hanes cotton/polyester Teflon finished ticking; perfect for the outdoors and indoors. We also offer our strong bonded, low-melt, layered-polyester standard cumulous fiber fill. It's a unique material because it will not retain water, which helps prevent the growth of mold or mildew. For indoor cushions, we provide the following choices: foam fill, or a Deluxe fill which is indoor foam wrapped in1" batting to give a crowned or loft appearance. We offer a custom measurement cushion guide for the following styles: bench, window seat, chair, chaise lounges, as well as overstuffed cushions for wicker, rattan, and settees. We pride ourselves in creating beautiful custom cushions using the templates you provide. Because our cushions are made in half inch width or depth increments, please round to the nearest half inch. Measuring, at this point, is critical. To ensure a proper fit, please follow the guide below. When measuring depth, start at the back of the seat and measure forward to the front. Please note: when using an existing seat cushion, use a straight ruler to get an accurate measurement. When measuring width, measure side to side. This will provide us with an outer dimension of your cushion. Determine the thickness you want in one inch increments. 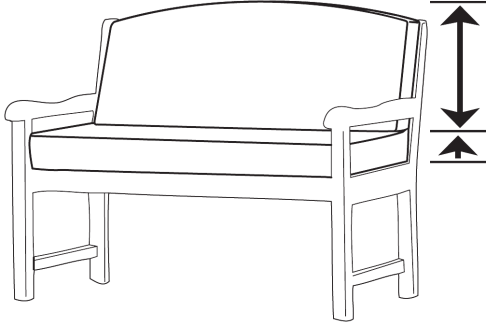 Cushion thickness choices range from 2 – 8 inches. Note: remember to subtract the thickness of the bottom from the length of the back cushion. Please measure all chair cushions carefully, paying close attention to special shapes and sizes. Your template will be required for all wicker furniture cushions. Follow the following wicker cushion template steps to insure you receive a proper fit. Please provide a template to define your specific cushion shape, as well as the outer cushion dimensions, to ensure accurate pricing and fit. Note: Widths vary from the front and back. Please check both ends to confirm your measurement. Experience the custom difference of our experienced and talented workroom team at Designer Custom Source. If your cushion is NOT square, rectangular, or shown online, it will require a template. Please use thick butcher paper, or cloth, to create a reliable template. As cushions and fabrics age, the shape of a cushion can become less than symmetrical. To insure a symmetrical template, fold it down the middle, cut as needed to balance the pattern and double check your new template with your furniture. EXISTING CUSHION SHELLS CANNOT BE USED AS TEMPLATES. Step 1: Place your cushion on top of thick butcher paper, or cloth. Step 2: Trace around the cushion and cut out the shape. Step 3: Test your template for fit. If adjustments are needed, please make sure to securely tape the paper together. Only one pattern is needed for each cushion shape. Step 1: Lay out a sheet of paper on the furniture piece. Firmly press the paper flat to fit the outside edges of your furniture. Step 2: Trace the outside edges to match your new cushion shape. This template becomes the exact shape and size of your custom-made cushion. Step 3: Once your pattern has been cut, test for an accurate fit. If adjustments are needed, please make sure to securely tape the paper together. Only one pattern is needed for each cushion shape. Please double-check all measurements.